Pretty Papers, Pretty Ribbons, Pretty cute calf! 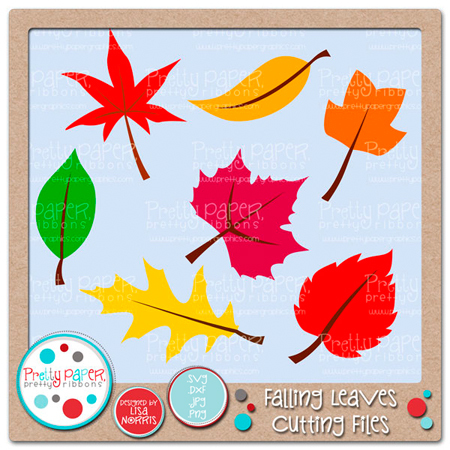 I just love how there can be so many ways to use digital cut files! The possibilities are endless when you get to chose all the finishing touches! So that’s how I was able to use some valentine/love themed files with photos from the fair! See? A totally adorable calf and my kids loving on it = Fair + Love! 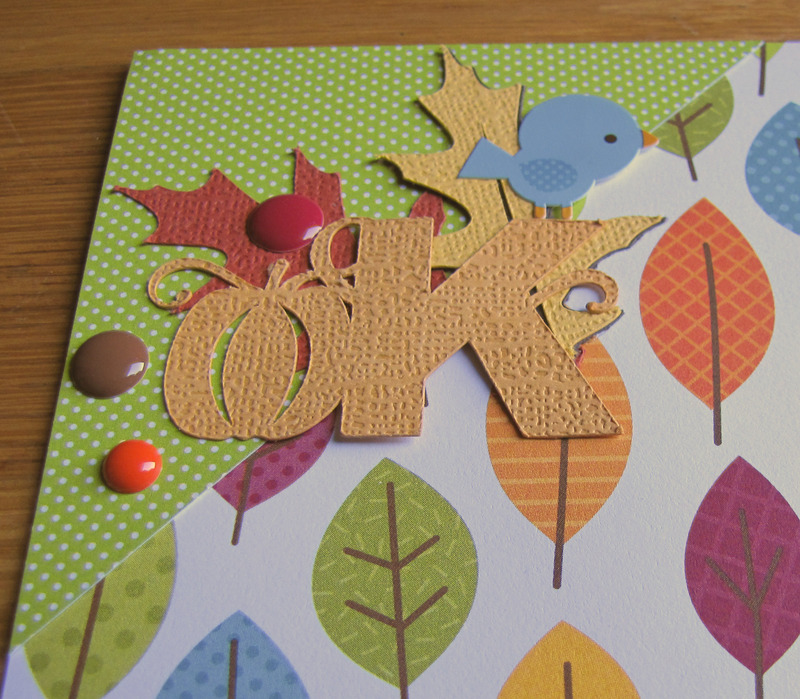 I also mixed in some Fall Festival files for ambiance – can’t resist those details! I used the Moovelous Cutting Files for the cow and the title, the ***BUNDLE*** Fair Fun Cutting Files for the tickets and Fall Festival Cutting Files for the hay bale and the bit of fence. These pictures were just too cute not to scrap once I rediscovered them. I’m just so happy my kids got to have these experiences! Here at the end I’m saying goodbye. 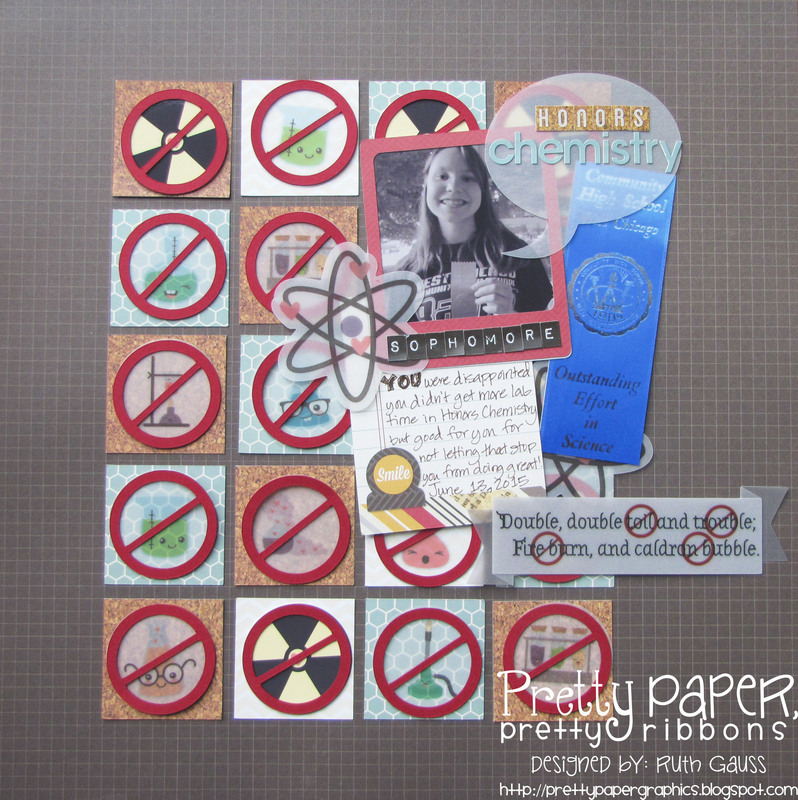 Not to blogging, but I’m retiring from the Pretty Paper, Pretty Ribbons Design Team. My life is heading in a new direction and so it’s time for me to step down from this commitment. 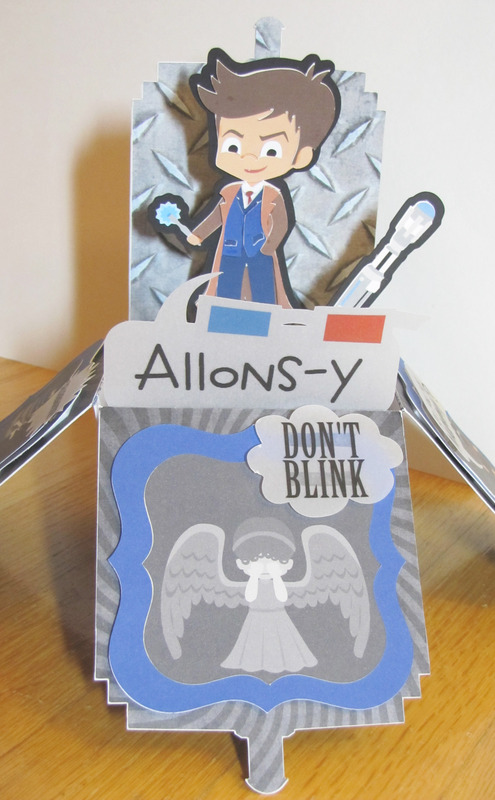 I will still share paper crafting projects here on my blog, but it probably won’t be as frequently as in the past. I sure hope you’ll continue to follow my blog – goodness knows it won’t be clogging up your inbox with e-mails in the coming months, LOL! Thanks so much for all the support and encouragement and thanks especially to Lisa for letting me play with so many of her wonderful files! I really smiled a whole lot over the past year!!! I used Snippets patterned paper (and sticker) from Studio Calico and cardstock from Bazzill, Close to My Heart and Simon Says Stamp. Hi, there! I was so honored to be asked to be a Guest Diva for Die Cuttin’ Diva’s Weekly Challenge. 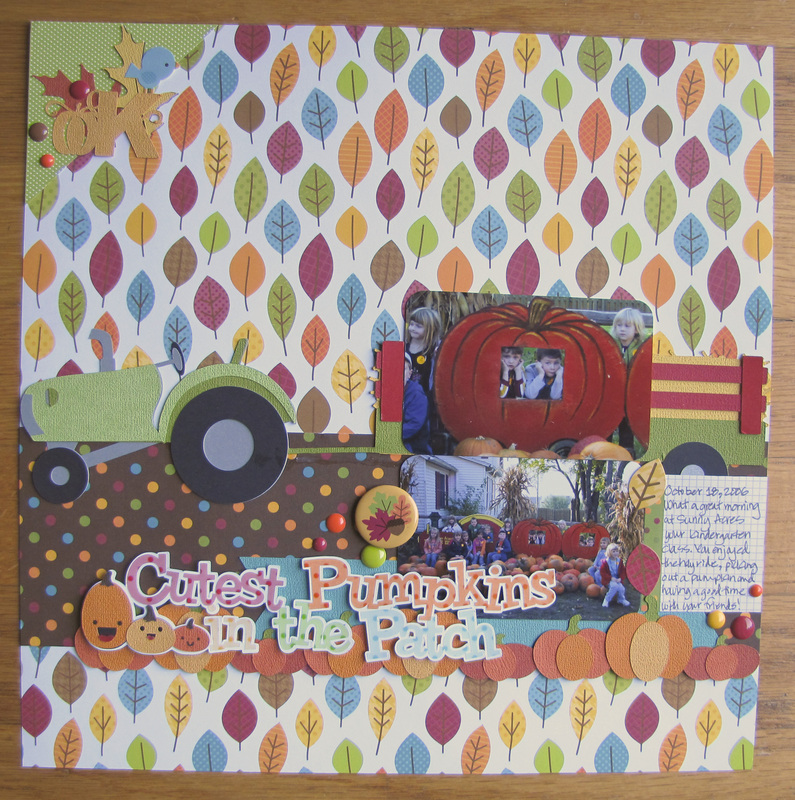 I chose to do challenge #234 – Scarecrow or Pumpkins, which starts today, because I had plenty of projects and awesome digital die cutting files to play with for those shapes. I adapted the title to say pumpkins by ungrouping the title, copying the word Cutest and the background layer, cutting the “s” from both of those shapes and then welding the “s” onto the word Pumpkin as well as the background layer – pretty easy and I think it turned out great! I just mirrored the whole image so the trailer was on the right. I will definitely be using lots of the fun images from this set to tell the story of our fun times doing corn mazes, when those stories get scrapped. I am so in love with this border! It is just so wonderful in so many ways! 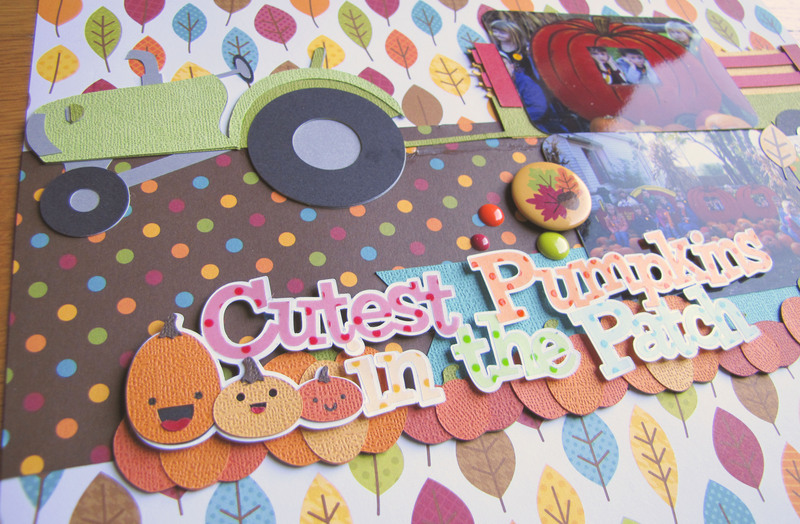 I was the perfect element to anchor the area with the photos and title, here’s the file, which has five different wonderful fall themed borders I almost used them all! Thanks so much for visiting today! I’m so happy you stopped by! I sure hope you’ll join in this fun challenge! I’d love to see all things pumpkin and scarecrow! 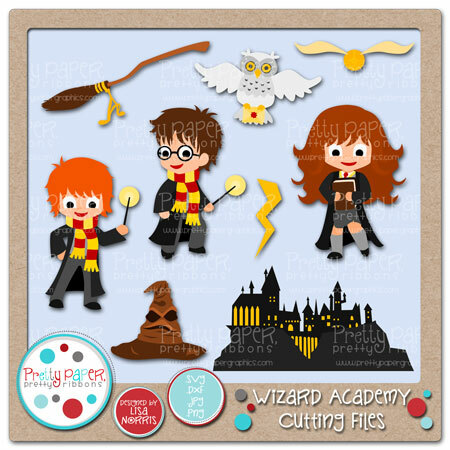 Be sure to stop by the Die Cuttin’ Diva’s Weekly Challenge blog to see all the rules and to enter! Pretty Paper, Pretty Ribbons, Pretty Good Friends! Hello! I’m up on the Pretty Paper, Pretty Ribbons blog today sharing a Design Team project (and obviously here, too, with a few more details.) If you didn’t hop with us yesterday I definitely recommend checking out all inspired projects, picking up a number of freebies and possibly winning some blog candy (go here to get started or here if you are hopping through and want to see my post)! One of the things that I love about using Lisa’s files is that she has created some cuts that support the many books and series (movie and TV) that my family loves. Harry Potter is very high on that list. My kids are teens now, but when the movies and books were coming out, they were pretty young so Lisa’s cute images of young wizards are perfect for documenting our love of the series! It’s so fun to be able to print and cut so that I have the perfect papers and colors every time! This page came together very quickly and easily because of that! Thanks so much for stopping by and I hope the rest of your weekend is great! P.S. I used a sketch from Paper Issues Sketchy Saturday for my layout (it’s based on a layout by Lisa Dickinson and I loved the grid – are you seeing a pattern here?) I just turned the sketch 90 degrees. Welcome, Mateys! 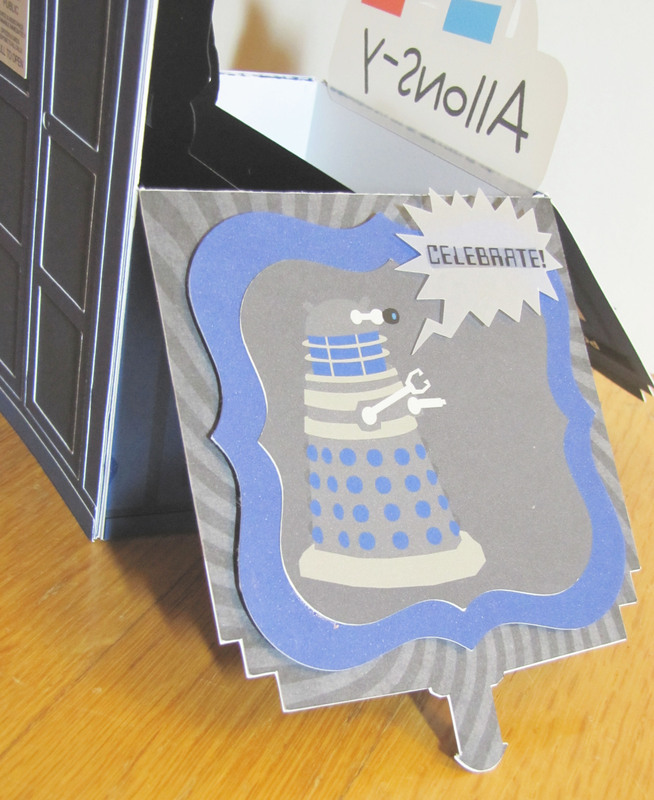 I’m so glad you’ve sailed on over to my blog today for our blog hop! If you came here from Nicole’s blog, you are in the right place. If you just stumbled upon this post (maybe you’ve had too much ale?) 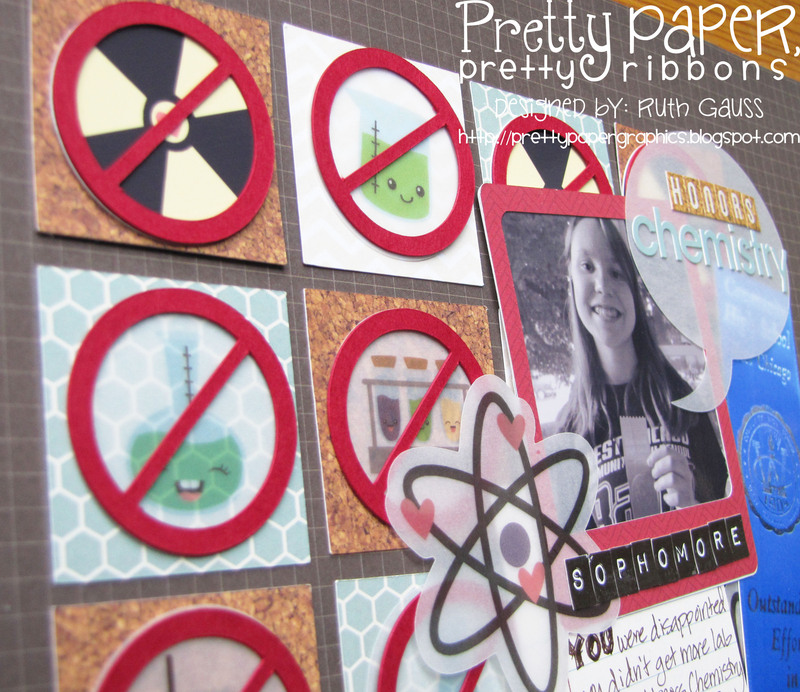 and would like to start from the beginning, please visit the Pretty Paper, Pretty Ribbons blog. I found a wonderful PageMaps sketch (linked at the bottom of my post) and filled all the areas with photos and die cuts! I used print and cut quite a bit, but also added some detail with the Silhouette printable foil in gold and silver to add some shine to the lock, sword blades and the hook. I loved the title from the Ahoy Matey Title Cutting Files. 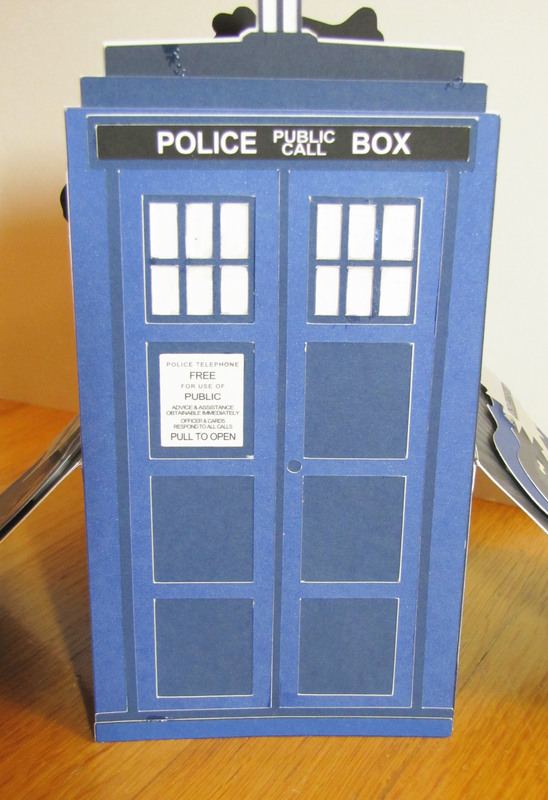 I did print and cut for the background layer and cut the red and black from paper and layered them all together. 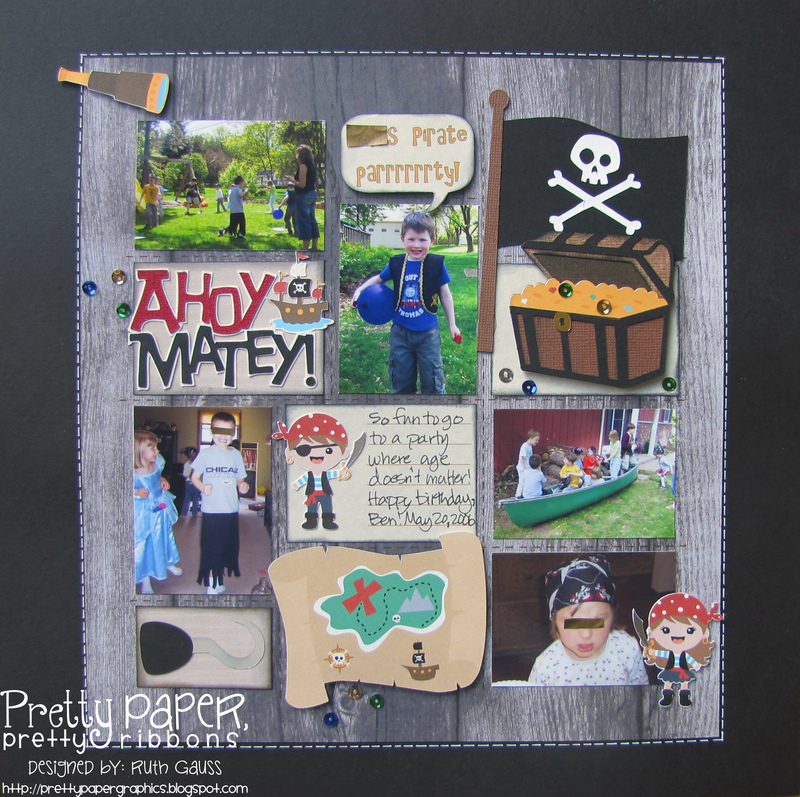 The subtitle is printed on Speech Bubbles Cutting Files (I used the color match tool to get the same yellow as on the ship) and the little pirate boy is from the Little Pirates Cutting Files, which has all the other pirate themed cuts I’ve used on my page. 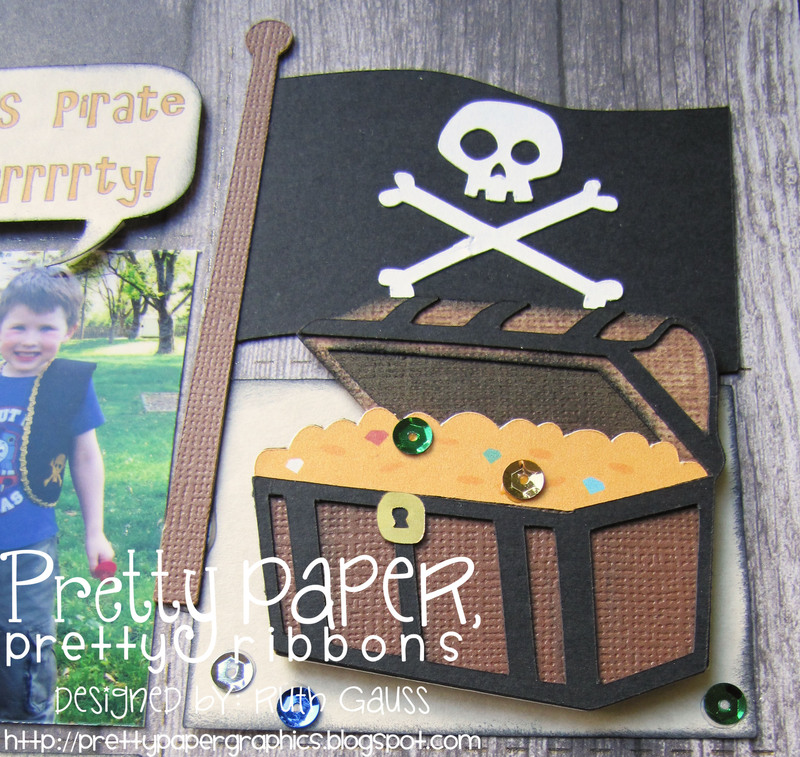 For the treasure chest, I printed the treasure layer, the rest are cut from cardstock and distressed. I thought a few sequins would make a nice shiny, addition. 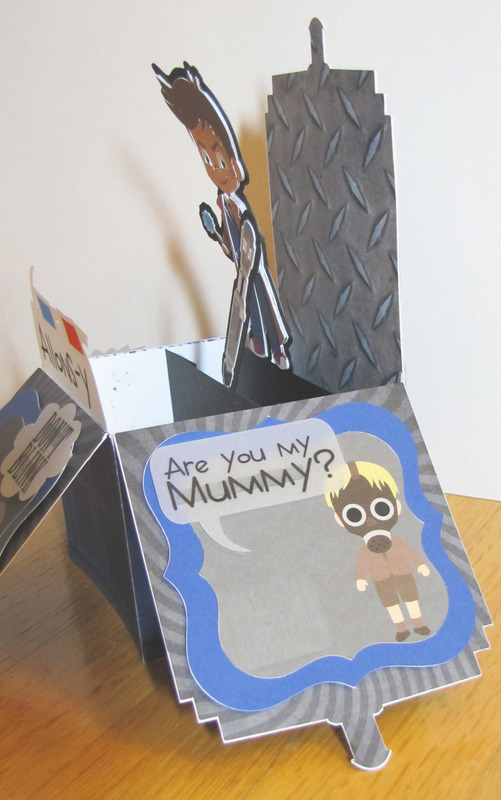 I hope you’ve enjoyed seeing my page as much as I had creating it! 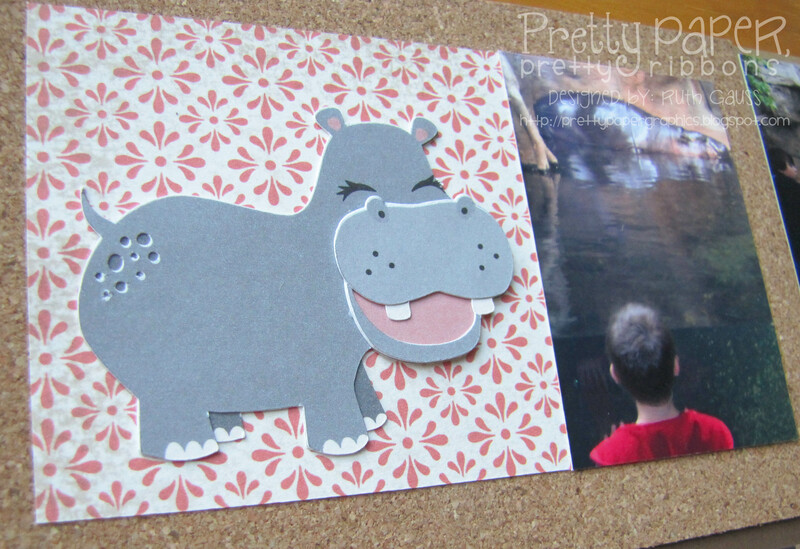 Now onto some blog hop business! 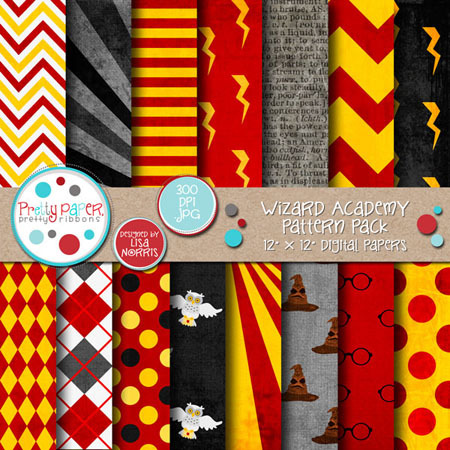 The blog candy for this hop is a $15 GC to the PPPR store. For a chance to win, you must be a follower of each blog and leave a comment on each blog. 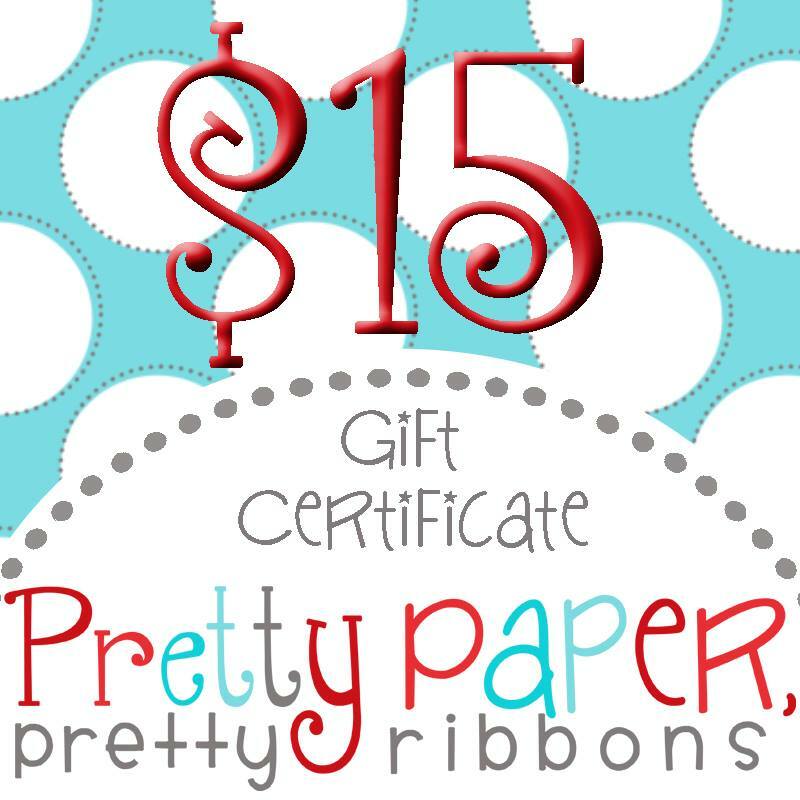 For extra chances, you can also LIKE Pretty Paper, Pretty Ribbons on Facebook and/or sign up for the Pretty Paper, Pretty Ribbons Newsletter. 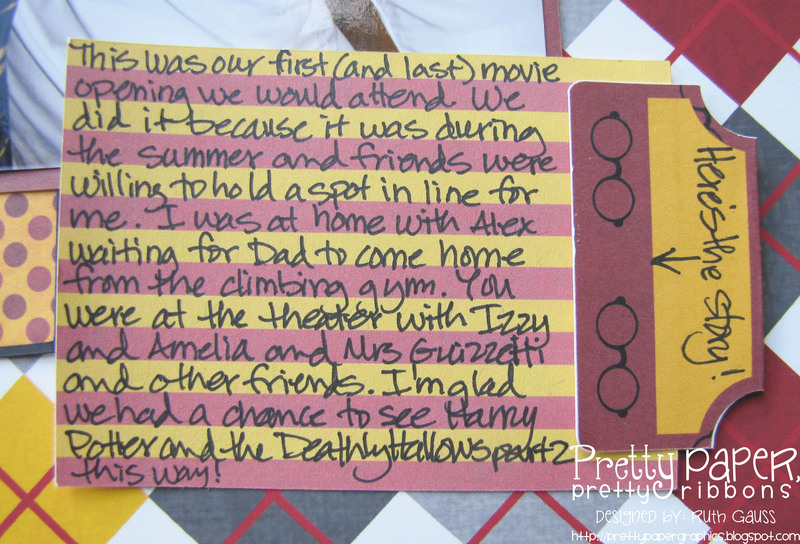 A random winner will be chosen for the prize on Tuesday, September 15 and announced on the Pretty Paper, Pretty Ribbons blog. 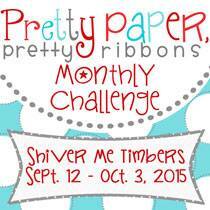 I sure hope we’ve inspired you to join in the PPPR Shiver Me Timbers Challenge. 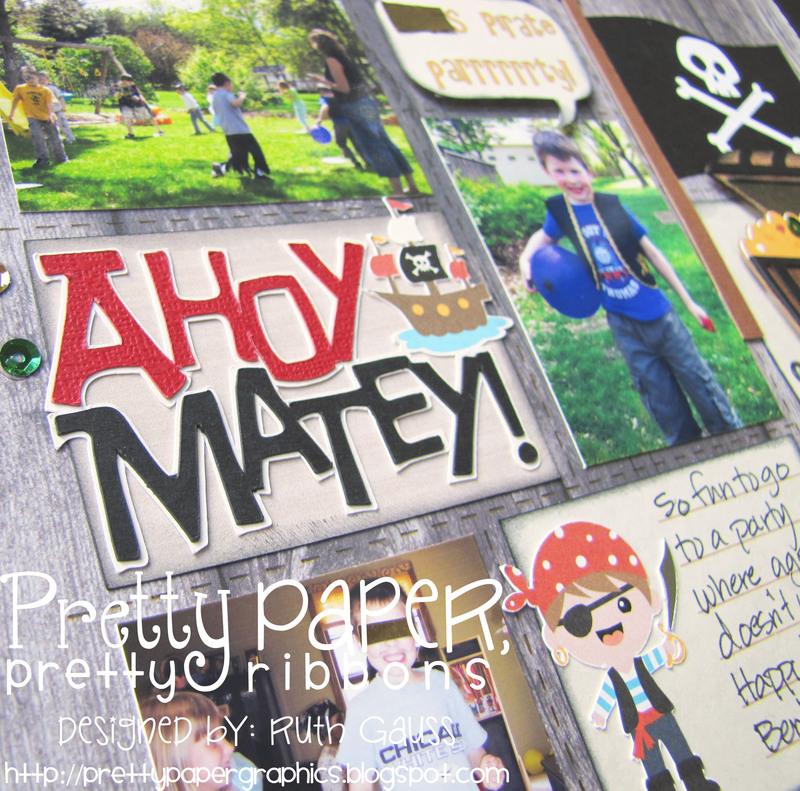 The projects can be anything that are pirate themed and feature Pretty Paper, Pretty Ribbons files. Check out all the rules here. One random participant will win $20 to PPPR. OK, I think I’m ready to send you to the next port of call: Sarah’s Blog. Pretty Paper, Pretty Ribbons, Pretty Hard Worker! Hi! 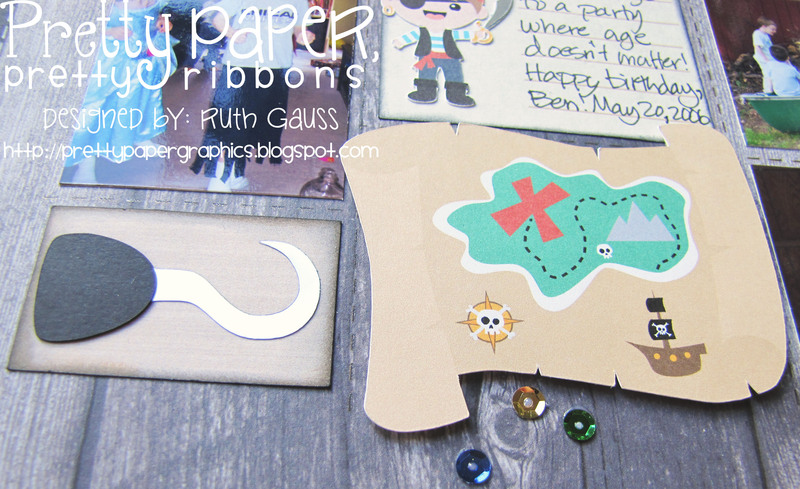 It’s my day to share a project over at the Pretty Paper, Pretty Ribbons blog and I’m also sharing here, with a few more pictures and details. 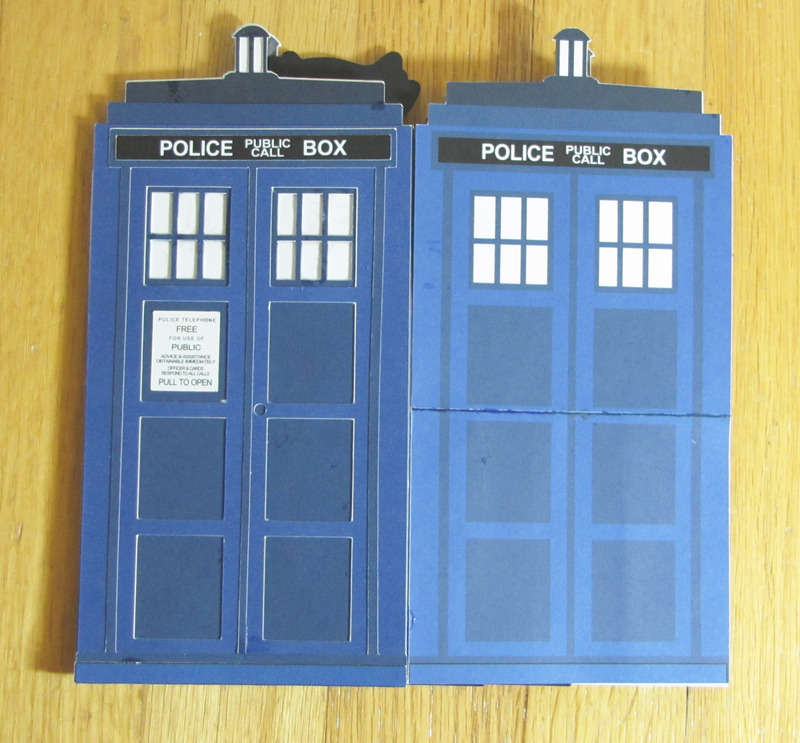 As you may notice, I did a lot of print and cut with vellum. The title is on one of the Speech Bubbles Cutting Files shapes and the frame around my daughter’s picture is from Photo Frames 1 Cutting Files. I used a banner from Sentiment Spots 3 Cutting Files for the subtitle. 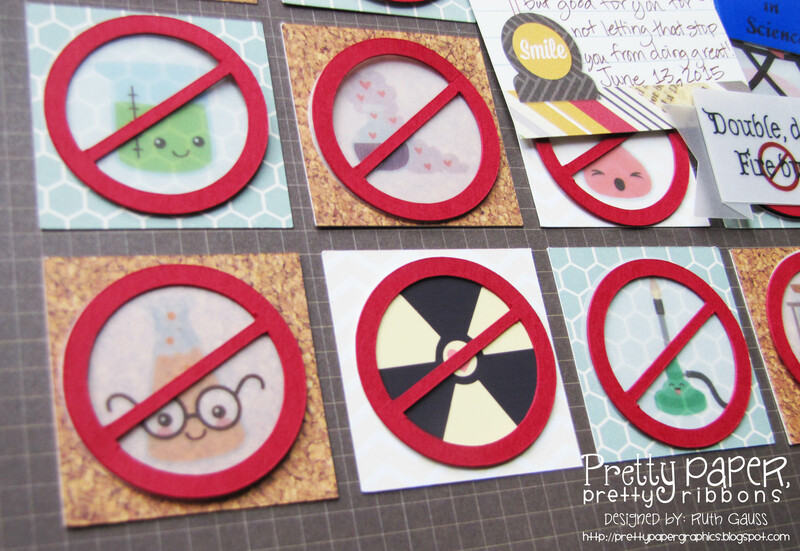 I used the 24/7 collection from Simple Stories for the patterned papers and alphas and the cardstock for the “no” symbols is from Simon Says Stamp. I am entering Silhouette Challenges #28 Anything Goes. 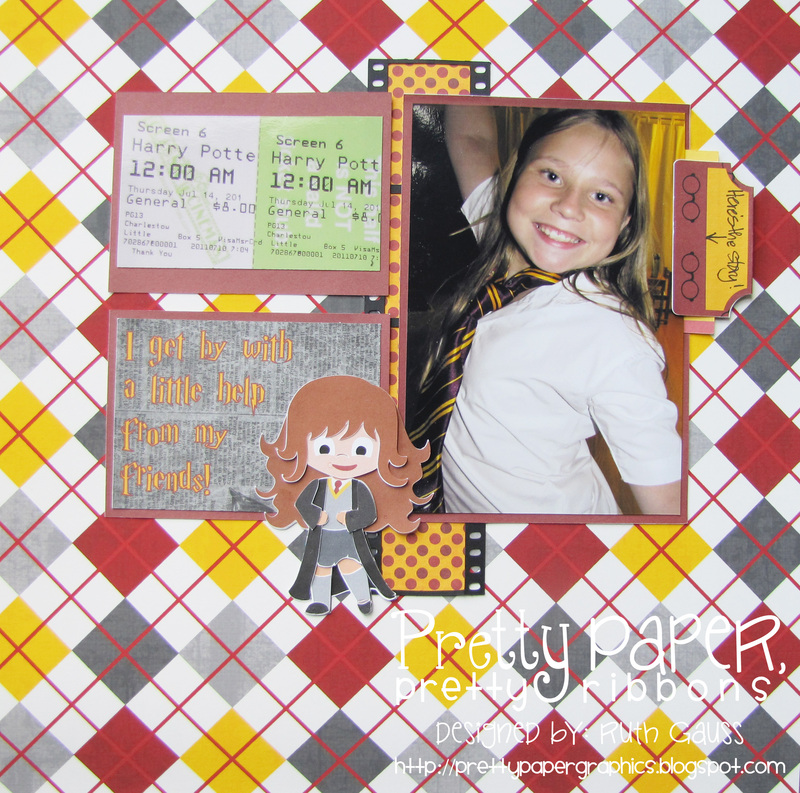 ETA : I’m also linking up to the PDE Anything Goes Linky Party. 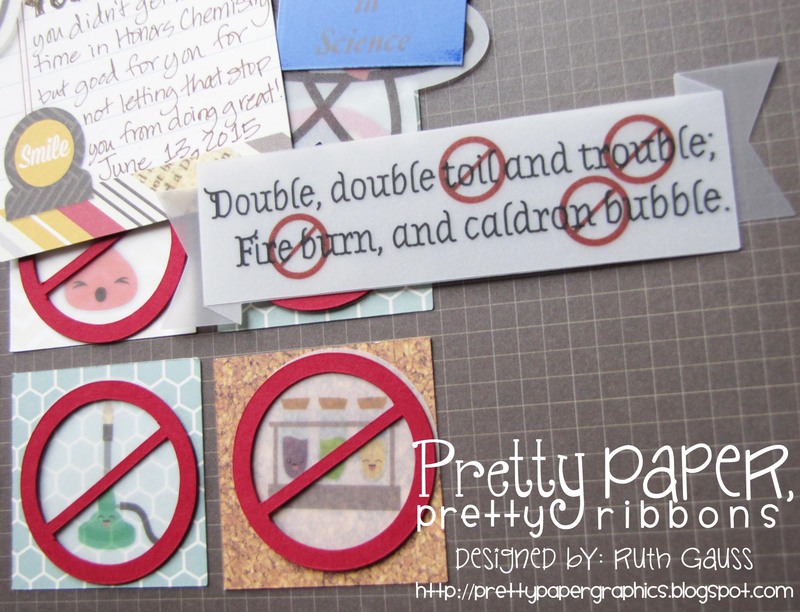 Both Silhouette Challenges and PDE Linky Party are fun places to link up your creations if you just like having blog visitors without a prize for linking up. Pretty Papers, Pretty Ribbons, Pretty Fun Day! 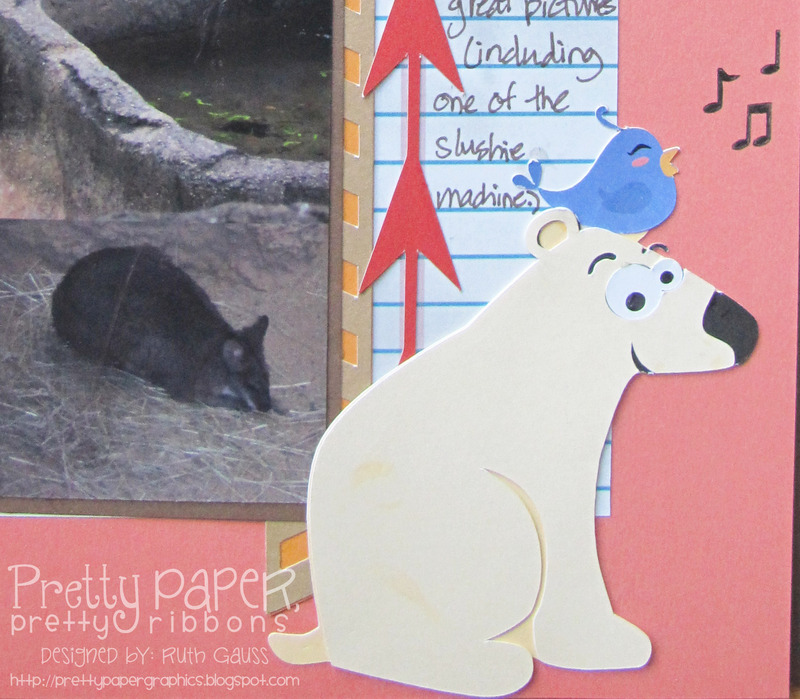 Today is my day to post on Pretty Paper, Pretty Ribbons to share a project and I’ve created a page about a very fun day at the zoo using a number of fun animals, borders and one drink cutting file along with some digital papers. 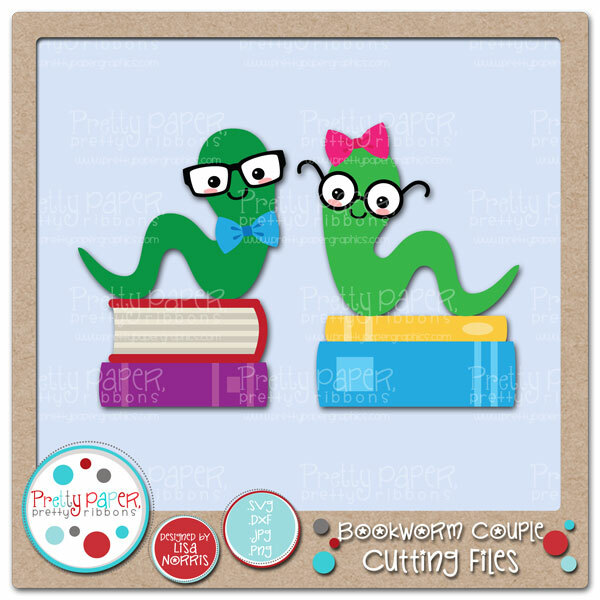 There were so many cute files that were perfect either to go along with the photos on the page or to fill in the blanks for a photo that didn’t make the cut, so to speak! I used the zebra from Safari Love Cutting Files, the arrow files from Borders 4 Cutting Files, Icee Cutting Files (yes, there’s a drink so I am entering Simon Says Stamp Simon Says Food and/or Drink), the polar bear came from Winter Critters Cutting Files and the bird from Gnomies Cutting Files (I used a Silhouette Sketch Pen to draw the notes.) 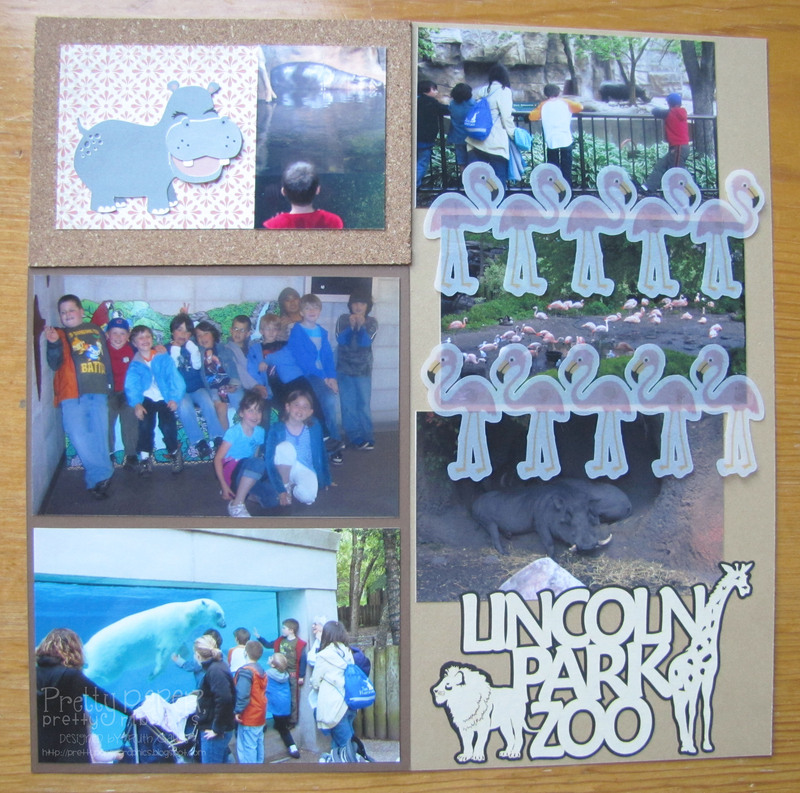 All the animals were done with print and cut and then I glued the layers together. 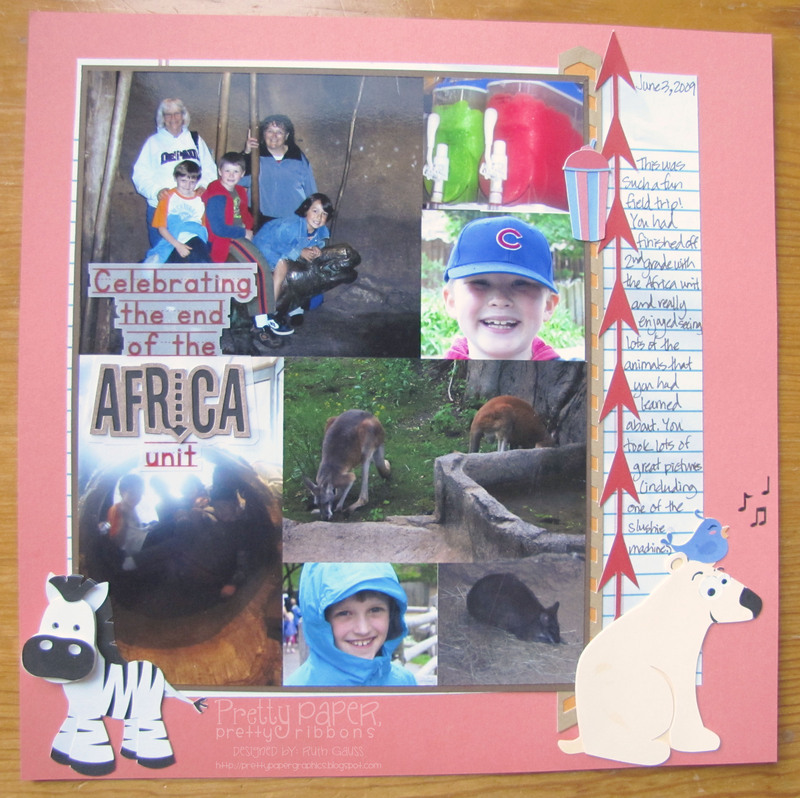 The texture on the word Africa as well as the lined background paper where I did my journaling came from School Days Pattern Pack. Another page done, another story told. 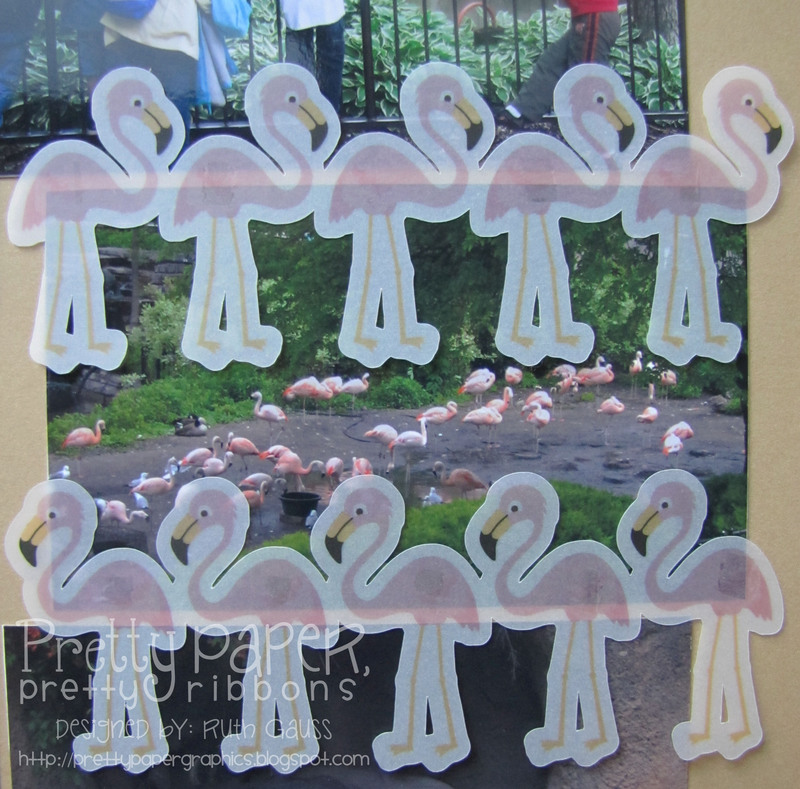 I guess I’m a bit obsessed with vellum right now, but I couldn’t resist those flamingos and in order to get lots of them on the page I wanted them to be a bit ghostly. 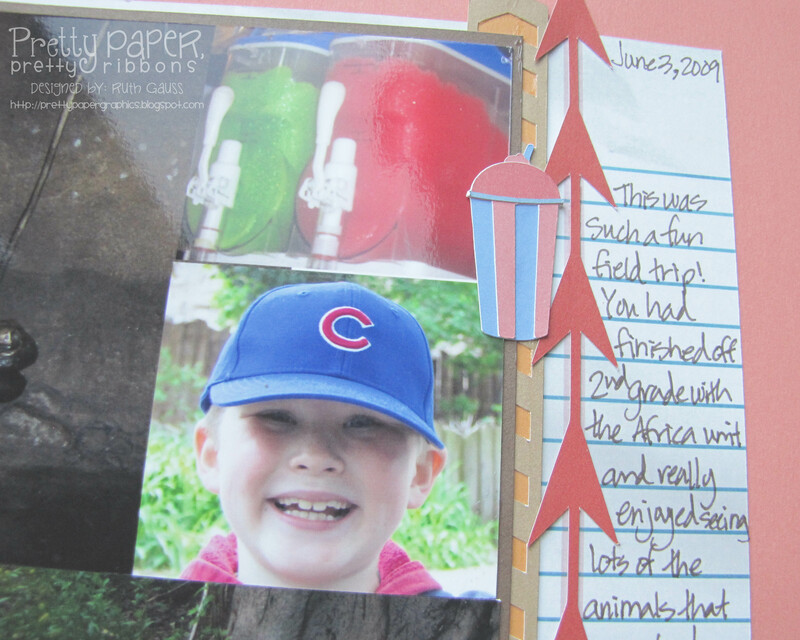 I’d love to see your Smarty Pants themed project using Pretty Paper, Pretty Ribbons cut files – there are lots of ways to go with this theme and I think my page about a school field trip would qualify. Click here for all the details! Thanks so much for stopping by today! I hope you’re having a fabulous day! 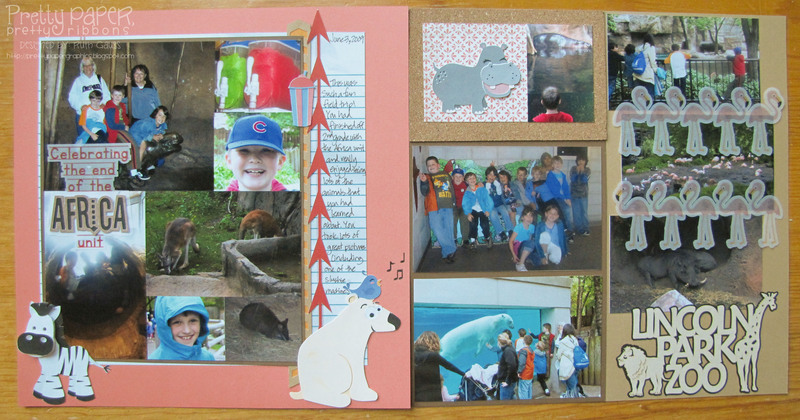 The photo collage I used on the left page was an old template for Photoshop that I had downloaded from SBE a long time ago. Both made creating this layout with 13 photos much easier so I really appreciate that these resources were available to me. Hopefully, I’ve gotten everything linked up now. Thanks for sticking with me, here!